ABRA Registered Kennels will automatically be added and/or highlighted on American Bulldog Resources. 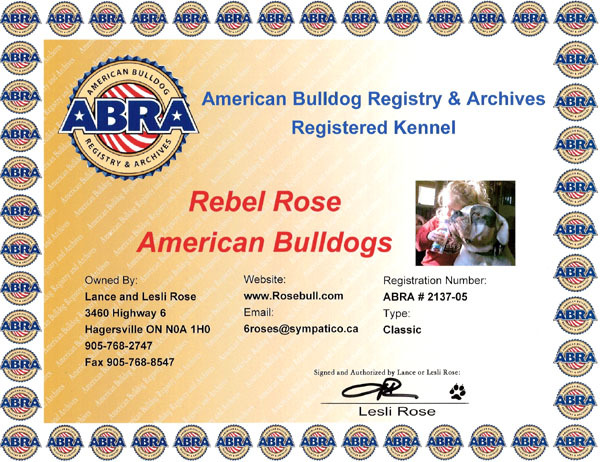 All ABRA Registered Kennels will have the ABRA logo added to their listing on the American Bulldog Resources Master List and receive a 25% discount on all American Bulldog Resources products such as puppy ads, hot links and "The Works" packages. The cost to register your kennel with the ABRA is $50 USD. A Kennel Registration certificate will be mailed to your address. If you have a logo that you would like to see on your certificate, please email it. Please either mail a check or money order with your kennel name, your name, address, phone number, email address and website URL or www.paypal.com the money. Our PayPal email address is E-mail@ABRA1st.com and email your request.